Organized around the central theme of homeostasis-how the body meets changing demands while maintaining the internal constancy necessary for all cells and organs to function-HUMAN PHYSIOLOGY helps you appreciate the integrated functioning of the human body. 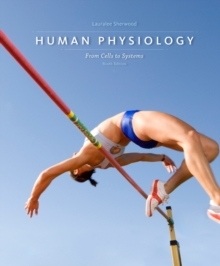 Author Lauralee Sherwood uses clear, straightforward language, analogies, and frequent references to everyday experiences to help you learn and relate to physiology concepts. The vibrant art program and empowering digital resources-including robust 3D animations and rich homework problems -enable you to visualize important concepts and processes. By focusing on the core principles and sharing enthusiasm for the subject matter, Sherwood helps you develop a solid foundation for future courses and careers in the health profession.